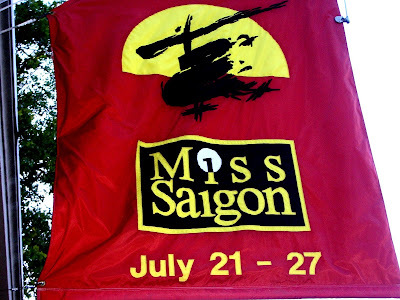 Our purpose for visiting St. Louis was to see Eric in "Miss Saigon". We flew Southwest airlines for the first time, because it was the cheapest fare available and I was very favorably impressed. There was no line checking in at the airport, the attendants were dressed casually in shorts and polo shirts and cracked jokes the whole flight. We arrived on time and our baggage was at the carousel in minutes. We had decided to rent a car, since taking the public transit would still not put us near our hotel. Georg had brought along the GPS and it guided us there in a half hour. We knew it would be hot and humid in St. Louis and it certainly was! Thank God for swimming pools and air conditioning. 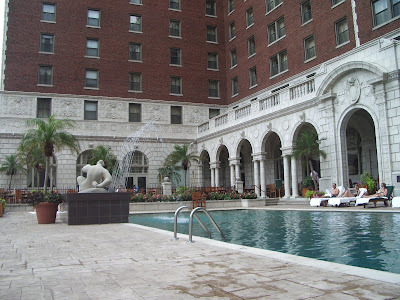 The Chase Park Plaza had been recommended to us and we got a special rate. Our one bedroom suite on the eighth floor overlooking the pool was very comfortable. We had a living room with a flat screen TV, which made Georg happy. He quickly ensconsed himself on the sofa with the remote. I was happy with daily visits to their gym and pool. The pool cafe was delightful for late night drinks and appetisers, while live entertainment was available inside. 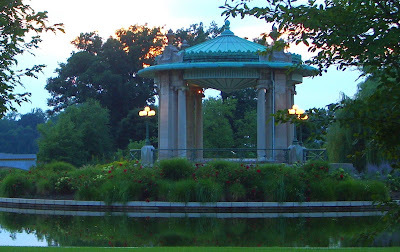 I loved the location as well, within easy walking distance down Euclid in the Central West End for shops and restaurants and right at the entrance to Forest Park, where the Muny and the zoo are located. Our first stop was at Straub's Market a few blocks down from the hotel so we could stock up on beverages and snacks. It was pretty pricey and I was happy I had brought the two bottles of Chardonnay from home. Georg was tired and I wasn't so I decided I'd attend the theater that evening alone and take a chance on a free ticket. 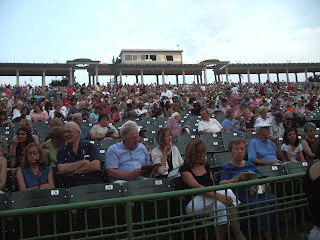 (A certain number of tickets in the 11,000 seat outdoor theater are set aside for free seats.) 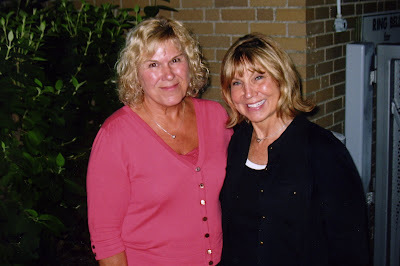 I had been in contact with Sherry, who had emailed me from the Eric Kunze fansite and who wanted to meet me. We actually met at the theater that night and hit it off immediately. We had a common bond in our interest in Eric, after all. The theater had a ballpark atmosphere, complete with refreshment vendors strolling the aisles before the performance and during intermission. We even stood for the National Anthem before the show began. But as soon as the music began we were transported to Saigon, 1975. The Engineer and the bar girls are onstage, the Marines are singing "The Heat is on in Saigon" when suddenly two Marines stride on stage left. At that moment, I don't even recognize Eric as he strides onstage in his camouflage uniform. He looks totally different from the last time I saw him in his loincloth as Joseph a few weeks earlier. His gait, his body language and demeanor have completely changed. As he lolls on a chair smoking a cigarette the expression on his face is at the same time jaded, disillusioned and bored. (I had my high powered binoculars after all!) It is a delight to watch those emotions slowly fall away as he notices and becomes interested in Kim, an innocent young girl who has fallen into the Engineer's trap. The love story which develops between them is achingly beautiful and the songs they sing together haunt me still. Theirs is a tragic story and doesn't end well. The famous evacuation scene in "Miss Saigon" was even more dramatic because in this open air venue they were able to use an actual helicopter. Now that I am home, every time I hear a helicopter I am instantly transported back to St. Louis. That first night Sherry and I went back to the stage door to congratulate Eric. There was a throng of people but Eric saw us immediately and came over to greet us. While we were waiting, one of the cast, a young man who was a fan of Eric recognized me from the fansite. Afterward, Sherry and I drove back to the Chase and met Georg for drinks at the poolside cafe. We discovered many common interests and made plans to see each other again that weekend. 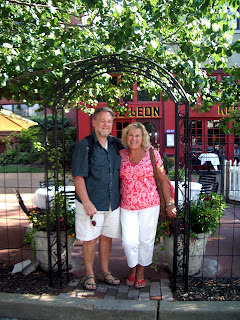 The next day, Georg and I had a late breakfast at Kopperman's Deli in the CWE, strolled a bit and took some photos. Later, another wonderful woman named Jill who had contacted me from the fansite picked me up from the hotel and we went for coffee. 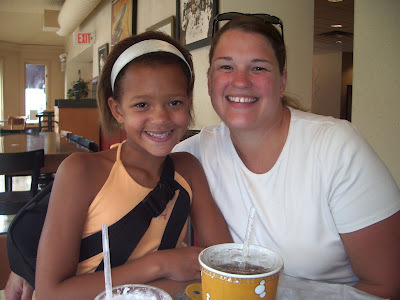 She brought her daughter Kelsey, who had been in a show with Eric last year and they were both fans of his. We had a wonderful visit together and we intend to stay in touch. Kelsey is a singer and hopes to have a musical career. I put them in touch with Sherry, who is a drama coach and who could help guide their choices for Kelsey. God works in strange ways! Georg and I drove to the Muny that evening. It was a lovely balmy summer night and we parked in such a way for a fast getaway afterward. We had a long walk into the park past the Gazebo and the pond filled with turtles and fish. The setting sun cast a glow which was enchanting. 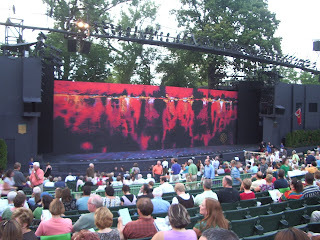 Each evening I enjoyed the show more and more as I became more familiar with the nuances in the performances. The stage is vast, but good use was made of the space with the large cast doing formations with tall red flags, a huge undulating parade dragon and brilliant costuming. The revolving part of the stage emphasized the heartbreaking drama of the fence which separated Chris and Kim as they were trying to reach each other during the chaos in the evacuation scene. 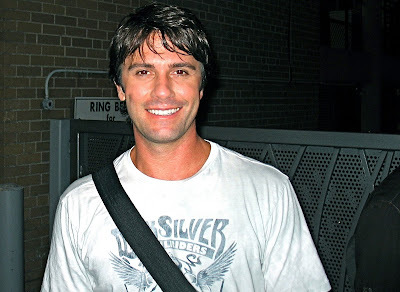 It was a very dramatic and physically exhausting role for Eric because he puts his heart and soul into everything he does and it shows onstage. Even those people sitting way in the back of the theater must have been able to feel his passion. After the show is over, it must take him awhile to regain his normal optimistic personality. We had the great privilege that evening of meeting Eric privately at the poolside cafe. Georg enjoyed his company as much as I did. We had a nice long visit and I asked him a great many questions. He must feel as though he's with Barbara Walters when he's with me. (At least I don't make him cry). I bring a long list with me because when we're together my mind goes completely blank. I never run out of questions! Poor Eric. He's gracious, polite, funny, has a great sense of humor, he's intelligent and has a great many outside interests. Since we were up so late the night before, we slept in quite late. After my workout we decided to visit the St. Louis Basilica. It is famous for it's installation of 41.5 million glass pieces. It's the largest mosaic collection in the world. A basilica is a large and important church that has been granted special ceremonial rites by the Pope. The St. Louis church was designated a basilica by Pope John Paul II in 1997. Later, we had our one expensive meal of the vacation and we picked a doozy. Chez Leon, a French restaurant was right up our alley. A fixed price menu enabled us each to order three items so we could taste and share. I always order foie gras when it's on the menu, so that was my first course and probably the best preparation of this dish I've had to date. It was followed by veal chops with wild mushrooms and a white wine sauce and for dessert Grand Marnier souffle. Georg had the foie gras as well, with duck breast and cheese for dessert. It was a really memorable meal and I'd go there often if we lived nearby. Then it was time to get ready for the theater a third time. I could have repeated this pattern night after night without getting tired of it. I was already getting a little sad our wonderful weekend was coming to an end. It amazes me that people can consistently repeat excellent performances night after night without a missed line, or a wrong note. I know Eric would disagree, he's seldom satisfied with a performance, but as a musician I was not able to find any flaws. 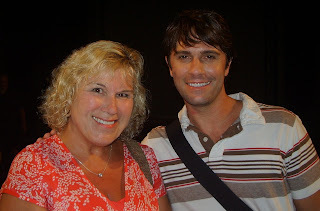 This time at the stage door, Eric waved us inside and showed us around backstage. The vast back lot is built around huge beautiful 100 year old trees. He showed us where the sets are constructed. They were already getting ready for the next show and were tearing down the Miss Saigon set temporarily for a rehearsal. He took us into his dressing room and offered us cookies which had been baked for him by a nun who always comes to see his shows. His fans really run the gamut from 10 year old kids to nuns! 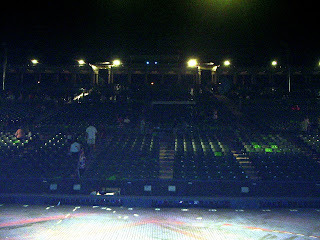 Then we were standing on the stage looking out at the 11,000 seats. I don't think I would remember my name faced with that audience. We sadly made our goodbyes and headed back to the hotel. Once again, I met up with Sherry at the poolside cafe for one last visit. Our Sunday was uneventful. We were able to see Eric to say goodbye and talked about seeing each other in Sacramento in a few short weeks hence. Our flight home, aside from a slight delay due to mechanical trouble was smooth. I don't know what I'm going to do when this summer is over. I will be suffering serious withdrawal. But this will go down in my memory as one of the most enjoyable summers ever!